At Greek Gear, it's our goal to make sure you are 100 percent satisfied with every order. That's why we're so upfront about all our policies and procedures. If you ever have a question about our shipping methods, customization options, security policies or other matters, we're here to help and provide straightforward, simple answers to your inquiries. On this FAQ page, you'll find quick answers to some of the most common customer questions. This lets you get the answers you need quickly so you don't have to delay your order. In addition to information about our company and our privacy policies, you can also get help ordering your products by checking out this page. We'll walk you through everything from our production times to our shipping fees to make sure you know exactly what to expect when you order from us. Plus, you can find out more about how to customize your orders to your specific organization, like with our sorority and fraternity T-shirts. And if you ever have questions that aren't answered here, you can always contact our customer service team for more information. For holiday shipping dates and times, please see our Holiday Shipping Schedule. Most production times are listed on each individual product. If you have a specific in hands need, please contact customer service. Remember, production time is not shipping time! We still need to ship the item to you and that takes time. If you are in a rush, we suggest you choose an upgraded shipping option at checkout. We ship all orders together complete. So, if you choose a 24 hour rush item and an item that takes 2 weeks to produce, you are going to be unhappy when your rush item is held up. Please make two orders if you need something faster with the benefit of our low standard shipping price. A production day is an actual business day and not a weekend day. Any order placed after 1 pm CST will count as the next business day. If you have questions or are up against a tight deadline, please contact us BEFORE you place your order regarding exact time lines. Even items that are not personalized, may need to be ordered, so contact us first if you are needing something right away. We are offering RUSH service on many of our gift items. What this means is that what typically may take 7 - 10 business days to arrive at our facility, will now be rushed shipped to us to cut your waiting time in half. Production times are not guaranteed. If we fail to meet your deadline, we will be happy to credit you back the rush fees. Greek Gear is proud to offer three shipping options to all of our customers: Standard, Premium & Overnight! Super Saver Shipping starts at $5.95: This option will enable Greek Gear to ship your order in our traditional best way, where we choose the most appropriate means (postal, UPS, etc.) to get the package to you within a normal time-frame. Upon COMPLETED PRODUCTION, your package will typically arrive within 5-7 days with our Standard option. Premium Shipping: This option requires us to get the package in-hand to you, the customer, within 2-3 days upon COMPLETED PRODUCTION (not counting weekends). In other words, once we complete the order (whether standard production or RUSH), we then will choose the appropriate shipping means to have your order to you within 2-3 days. Premium prices will vary based on size of order and shipping destination. You may check the amount for your order by choosing premium and pressing apply within the shopping cart. The next page will provide your Premium shipping costs. Overnight Shipping: This option requires us to get the package in-hand to you, the customer, within 1 working day upon COMPLETED PRODUCTION. In other words, once we complete the order (whether standard production or RUSH), we then will overnight your order to have it to you on the next business day (not including weekends or holidays) . Overnight prices will vary based on size of order and shipping destination. You may check the amount for your order by choosing overnight and pressing apply within the shopping cart. The cart will update and provide your Overnight shipping costs. Unless otherwise noted, items sold by Express Design Group, Inc. are subject to sales tax in select states in accordance with the applicable laws of that state. We collect sales tax in Illinois. For states imposing sales or use taxes, your purchase is subject to use tax unless it is specifically exempt from taxation. Your purchase is not exempt merely because it is made over the Internet or by other remote means. Many states require purchasers to file a sales/use tax return at the end of the year reporting all of the taxable purchases that were not taxed and to pay tax on those purchases. Details of how to file these returns may be found at the websites of your respective taxing authorities. To find out if we do charge sales tax, enter your address and hit apply, if we are now collecting state tax in your area, it will compute this (Before your order is placed). When trying to track your order with our online system, please be aware that it only tracks packages that we ship via UPS. Packages that we ship via the U.S. Postal Service cannot be tracked online at this time. Please also note that we do email you tracking information the day your order ships. It will include the tracking information, the method it was shipped and the estimated arrival date. Please also be aware of our production times. I do not see my group listed? Almost Any Group! Since we manufacture a large portion of our own merchandise in house, we can produce fraternity & sorority merchandise for just about any group imaginable. We hold licenses for over 100 Greek organizations. Find your merchandise. Pick Letter #1, #2 and #3 (if needed) or fill in the field with the name of your group. We will then customize your merchandise to your organization! The unique feature of our website is that you can create your own one of a kind merchandise in almost any color combination imaginable. In the few cases when we only offer a drop down box with prelisted organizations shown, we are only able to get that particular item for the groups listed. To provide you with the fastest service possible, once an order is in production, it cannot be cancelled. 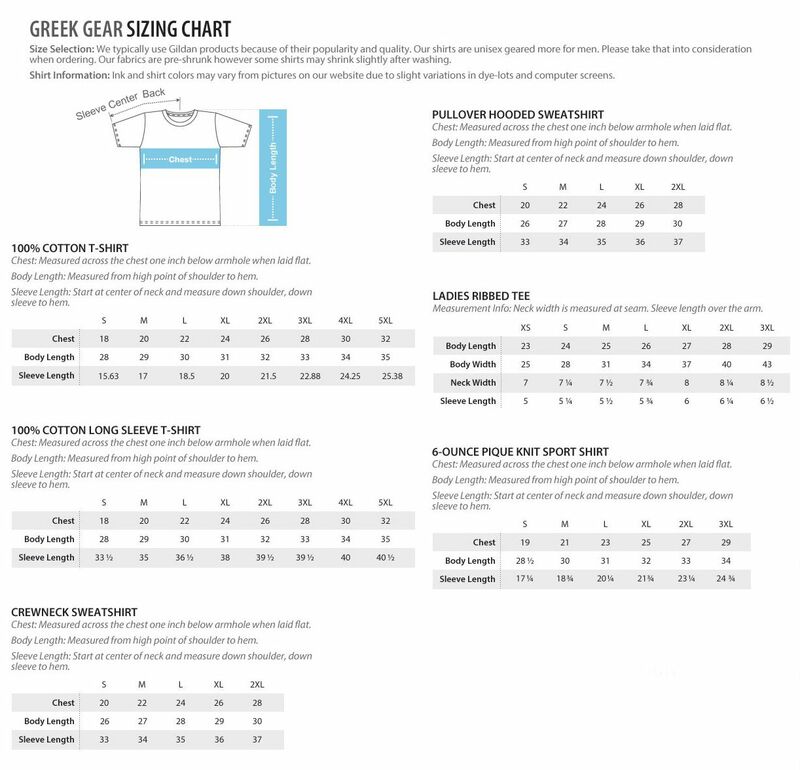 All orders are custom-made based on the customer's instructions at the time of ordering and as such, the customer is responsible for any costs incurred by Greekgear.com up to the point of cancellation. If we can cancel your individual order there will be a 25% processing/re-stocking fee charged for doing so. The receipt of an email order confirmation does not constitute acceptance of an order. The email order confirmation confirms that our system has received your order. We reserve the right to correct any rare pricing errors or other errors on our website, to limit the order quantity for any item, and to refuse service to any customer and cancel any order at any time. Verification of information may be required prior to the acceptance of any order. In the rare cases of a pricing error, we will contact you prior to fulfilling your order. In the event you need to change an existing order, we need to hear from you as soon as possible (within 1 hour of initial order confirmation). If the merchandise has already been entered into our system, it is unlikely we will be able to make any changes. In every possible case, we will do our best to accommodate you. We have different processes to produce our custom Greek merchandise, so we cannot guarantee if you order something today and reorder later on it will look exactly like your original order. In every possible case, we will do our best to accommodate you. Since each item is custom made to order, returns are generally not accepted and we are only able to accept returns on defective merchandise or mistakes we have made. In those cases a corrected, exact replacement is sent to you. You must notify us in writing within 7 days of merchandise receipt and a Return Authorization (RA) must be given. We also must receive the merchandise back within 10 working days from your receipt of the product. In the rare case that a return is accepted (non-customized merchandise only) there will be a 25% processing/re-stocking fee charged for doing so. We will not accept worn and/or used merchandise. Original and return shipping charges are non-refundable. We are not responsible for incorrect spelling, typos, names, text, or any errors made by the customer so please make sure your order is correct and without errors before ordering. We reserve the right to alter the size and/or layout of lettering, logo, or design so that it will fit imprint size restrictions and look attractive on the item ordered. Also, colors appear differently on every computer, tablet, and mobile device. The colors you see are not 100% accurate to the colors you will receive. Greekgear is not responsible for slight color differences. What if I chose the wrong size? Since we custom make most of our merchandise to order returns are generally not accepted and we are only able to accept returns on defective merchandise or mistakes we have made and in those cases a corrected replacement is sent out. You must notify us in writing within 7 days of merchandise receipt and a Return Authorization must be given. Occasionally, due to Manufacturers Greek logos and designs forever changing, we reserve the right to substitute similar merchandise of equal or greater value. We gladly accept American Express, Visa, Mastercard, Discover, Paypal and personal check or money order. Since most of our merchandise is custom made, we do charge the credit card as soon as the order is placed to insure a commitment from you. The Billing Information on your credit card will read: EDG/Greekgear.com. Congratulations for earning a discount or receiving coupons or gift certificates to Greekgear.com! You are a valued customer and we appreciate your business. REMEMBER: ONLY ONE COUPON PER ORDER! Coupons and discounts are valid for online orders only- they are not valid for phone or mail orders. If you have a coupon or gift certificates that can be redeemed from Greekgear.com - Fraternity & Sorority Superstore, please enter the offer code in the Coupon or Promotional Code box during checkout. You must click 'apply' to validate the coupon. Coupon, discount, and gift certificate adjustments will be shown at checkout. Coupons and gift certificates cannot be combined in the same order. Most coupons cannot be used on group orders that have quantity discounts. What is an address correction charge? Incorrect shipping addresses (wrong house #, wrong zip, missing apartment #, etc.) will incur a $20.00 charge for ground packages if correction is made after package has shipped. Incorrect addresses may also result in delayed delivery. Please double check your shipping address for accuracy. This fee is charged to us by UPS for incorrect addresses and will be billed to the credit card your order was placed with. If you feel you have been charged this fee in error, please contact us so we may dispute the fee with the package delivery company. We appreciate your understanding. Our carrier attempted to deliver your package but unfortunately, the address provided to us was incorrect. It was missing an apt #, street #, house #, wrong city, wrong zip code, wrong state, etc. Maybe you sent it to the school mailbox address but your hometown city and state. If your address is not 100% correct you will not get your package. The package will be returned to us once and we will contact you once the package has been returned back to us. We will resend your order out once we get the complete address, however, reshipment fees apply + any additional fees (typically, what you paid for shipping on your original order). It is important that we receive the proper address in order to ensure that the package is delivered in a timely matter. Please be sure to make sure your address is correct on all future orders to avoid this problem. No refunds will be issued for packages that are unauthorized upon arrival. What is your profanity statement? Express Design Inc. has the sole discretion to reject any order that it considers libelous, defamatory, obscene, profane, portraying irresponsible use of alcohol or other substances, advocating persecution based on gender, age, race, disability or national origin, containing explicit sexual content or is otherwise inappropriate for Express Design Inc. production. What makes material Profane According to the FCC, Profane Language includes those words that are so highly offensive that their mere utterance in the context presented may, in legal terms, amount to a nuisance.� In its Golden Globe Awards Order http://www.fcc.gov/eb/Orders/2004/FCC-04-43A1.html the FCC warned broadcasters that, depending on the context, it would consider the F-word and those words (or variants thereof) that are as highly offensive as the F-word to be Profane Language Express Design Inc. agrees with this definition. If a word or image is considered questionable upon receiving your order, our customer service office will contact you to discuss options PRIOR to production. Our custom party favors require some of the lowest minimums in the industry. You can place your order online and either submit your artwork to us, or describe what you would like in the comments section (at checkout) and we will email you a proof of your design. Due to manufacturing production standards, occasionally orders are shipped with an overage or shortage of products in the shipment. These are called overruns or under runs. We cannot be responsible for items damaged in shipment. Our standard procedure is to file a claim with the shipping company to get reimbursement money. We cannot set up the presses for a handful of items to replace them. We know being a college student is hard on the wallet, so we have put together some special exclusive Greek Gear coupons just for you to help make your shopping experience with us a bit easier! We know being a college student is hard on the wallet, so we have put together some special exclusive Greek Gear coupons just for you to help make your shopping experience with us a bit easier! Coupons are valid for orders placed online only. Previous orders not included. Remember one Greek Gear coupon per order! Selling of Sorority Intellectual Property? Buyer acknowledges and agrees that he/she is purchasing paraphernalia and other goods (collectively Goods) that bears Alpha Kappa Alpha Sorority, Inc. (Sorority) logos, copyrights and trademarks for a member of the Sorority. Buyer understands that a non-member is not supposed to own or possess such items, and agrees that Sorority retains all rights and ownership in the underlying Goods that bear Sorority logos, copyrights and trademarks. Thus, such Goods may not be resold by Buyer directly, on-line via a third-party (including but not limited to ebay.com, amazon.com, etsy.com, etc.) or by any other means. Any attempt to do so will result in the forfeiture of the Buyer�s right to possess the Goods, the immediate vesting of the Sorority�s right to possess the Goods, and the subsequent surrender of the Goods to the Sorority. We apologize, but we are unable to sell Zeta Phi Beta Merchandise. We are sad about it, but we are not licensed to sell their merchandise. We apologize, but we are unable to sell Delta Sigma Theta Merchandise. We are sad about it, but we are not licensed to sell their merchandise. Selling of Fraternity Intellectual Property? Buyer acknowledges and agrees that although he/she may purchase paraphernalia and other goods (collectively Good) bearing Omega Psi Phi Fraternity, Inc. (OPPF) logos, copyrights and trademarks, that OPPF retains all inherent rights and ownership in the Good and thus they may not be resold or offered for bid on-line or by any other means. Any attempt to do so will result in the forfeiture of the right to possess the Good, automatically empowers OPPF to have the item removed from sell or as a item for bid, and must be immediately surrendered to OPPF. We will never sell, trade, or rent any customer or gift recipient e-mail address or personal information to any third party. Nor will we share this information with any third party except to the extent necessary to fulfill an order or when the outside party is strictly acting on our behalf with no independent right to use the information we provide. We may provide aggregate statistics about our customers, sales, traffic patterns, and related site information to certain reputable third party vendors but these statistics will not include any identifying personal information. We may disclose personal information in the event that if we are required by law however. Accordingly, you authorize us to disclose any and all information about you to law enforcement or other governmental official as we deem necessary or appropriate with any investigation of fraud, intellectual property infringements, piracy, or other unlawful activity that is illegal and that may expose us to legal liability. Our order form collects customer contact information such as name, address, e-mail address, telephone number, and credit card financial information needed to process and bill an order. We take numerous precautions to protect customer information and the sensitive information that is submitted to us is protected both online and offline. The contact information is necessary to personalize and send information about orders to our customers, to fulfill and notify you of delivery, and to get in touch with you if necessary for customer service or questions about an order. We may also use customer information and the Internet Protocol (IP) address used to connect your computer to the Internet to improve the content of our site, to improve your shopping experience, and for marketing and promotional purposes. Customers may join our mailing list by choosing to register on our home page or during the checkout process. You can contact us to unsubscribe and we will remove your name and e-mail address from any future mailings. A page of our site is forwarded to the specified e-mail recipient only when you use the Refer-a-Friend feature on our site. For your security, all credit card processing is done through YAHOO's secure server. We destroy all credit card information after 30 days. Also, our secure socket layer (SSL) software is the industry standard and among the best software available today for secure commerce transactions. It encrypts all of your personal information including credit card number, name, and address, so that it cannot be read as the information travels over the Internet. Safety in Numbers: With our Secure Servers hosted with Yahoo! Shopping, you are one of millions of users every year who choose us to shop with! Is my email Safe from Spam? As a customer of Greekegar.com, we will occasionally email you specials and offers. All emails will have a 100% opt out option. We respect your privacy and never, ever will sell your email or your personal information. Do I have any other protection against fraud? Greekgear.com is hosted by Yahoo! and so you would automatically be covered by the Yahoo! Buyer Protection Program which provides up to $750 of fraud protection. Still don't wish to use your credit card on the internet? No Problem. There are two ways you can order from us without having to enter your complete credit card number on the web: Call in your order or send a money order. For details please call us at 1-866-Greekgear. 1. Lots of Discounts! At Greekgear.com, we regularly send out discount offers to our repeat customers. We are proud members of Yahoo! Shopping network and have achieved the highest rating possible. It is the five-star Top Service rating. We have been in business for over 12 years and are growing rapidly. We have thousands upon thousands of previous customers and have an approval rating over 99%. Please take an opportunity to read our feedback from previous customers. We believe it will reflect our previous customer's satisfaction and the quality of your future purchase. Most of our items have been approved by the national organizations headquarters for quality and design. We are the largest retailer of fraternity & sorority licensed goods in the U.S.
We respect your privacy. We do not sell our customer information to any other company. We utilize Secure Sockets Layer (SSL) encryption protocol. SSL protects customer information such as credit card numbers, names, and addresses during the exchange between your computer and our server. All credit card transactions are processed through our SSL secure server. You'll know the information is protected if the closed-lock symbol pops into view in the lower right- or left-hand corner of your screen while you are checking out. You can also verify secure pages by checking the address or URL listed on the location bar. If you spot an 's' after the 'http' at the beginning of the address, you know that you're browsing in a secure environment. We want to assure you that every purchase you make is a secure transaction. Once you are finished shopping and move on to our 'checkout' area, you will be transferred to our secure server, which will encode your credit card information and deliver it only to us. Our goal is to ship out all customer orders within the fastest time possible. If you have an important in hands date, let us know and we will do whatever we can to meet your deadline. Our customer service department answers emails and calls within 24 hours. Our goal is to answer all customer emails and calls within the same day. If you have any questions or comments, please let us know. Do you wholesale your merchandise? Interested in selling our products wholesale? Send inquiries via email to carrie.gravot@inarush.com. Once approved, we will grant you access to our wholesale website and mail you our latest Wholesale Catalog. *We only sell to businesses and will require an account be set up before we mail out a catalog and give access to our wholesale website. Not all products we sell on Greekgear.com are available for wholesale.